Okay – so the party wasn’t for me – it was for this lady. But it was my birthday. And it was a party. And it was fabulous! Mommy’s Martini, MomZombie, Unmitigated (the artist formerly known as Middle Aged Woman), Deb, Suzan (aka: swirly fabulous), Elizabeth, and GrandeMocha. Silly me, only took out my camera at the end of the night to take a few blurry photos. Scrapbook FAIL. But check out Bossy’s post on the night, as well as some of the other great bloggers above for actual pics. And then, on the way home, I got my first (actual) birthday present….. A lovely ticket from the State Police. Ha! I can only hope that next year (when, surprisingly enough I will be turning 29! again!) is just as good. That tonight’s gonna be a good night. The catchy tune by the Black Eyed Peas has been running through my head for a little while now. And a group of us are getting together at a local(ish) brew pup – Liberty Street Brewing Co. in Plymouth, MI. I’m hoping to reunite with a few of the great women I met last time – and meet a few more. Maybe even a guy will show up this time. A few other reasons why today is going to be good: It’s also my birthday. (woo-hoo!) So before making the trek to Plymouth, my good friend Brad & I are going to catch an afternoon showing of Iron Man 2. It’s also a sunny day – perfect for walking my foster dogs. I also went to the chiropractor this morning and feel very relaxed and stretched out after my post-adjustment rolling treatment. Also: the office staff at Dr Buller’s sang “Happy Birthday” to me when I walked in. How sweet! I hope you’ve got a feeling that today is going to be great for you as well. And I hope that there is some sunshine in your life, wherever you are. I’ve had a pretty good string of luck this year. Yup, 2009 has been all right! 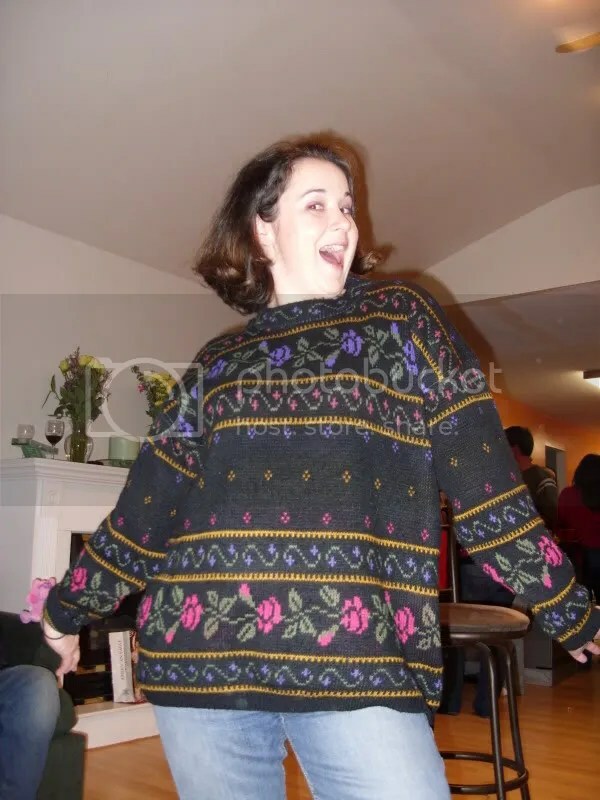 First, I won this spectacular sweater in the first annual Stupid Cupid Valentine’s Day party & white elephant gift exchange. I know you are SO jealous..
Then I went to the local farmer’s market near my new home on opening weekend, and I won the Harvest Basket. This meant that the following weekend, I could swing by and each vendor would donate something. I came away with fresh rhubarb, eggs, a caramel apple, 2 tomato plants, and some flowers. Yum. I won all three of these! Plus a 4th, holiday-themed one! 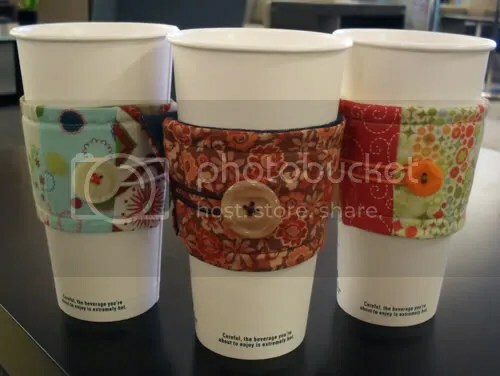 Instead of using a boring & wasteful cardboard sleeve at your local coffee shop, brighten your cup with a unique cozy! Please go check out her Etsy shop to see all of the styles she has on there – and pick one (or three!) out for yourself at One In The Hand. Thank you, Ashley! 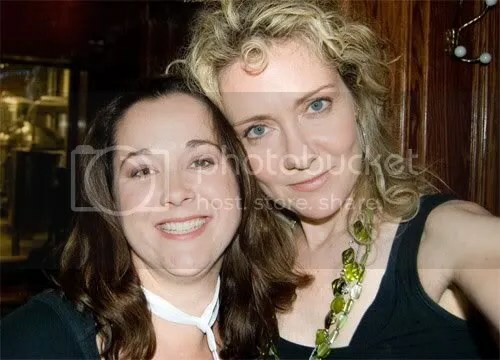 Each week, Candid Carrie hosts an event – Phriday Photo Phiesta! This is my first time playing along – I thought I’d give it a try as part of NaBloPoMo. My peeps in Kenya - I miss spending so much time with them! 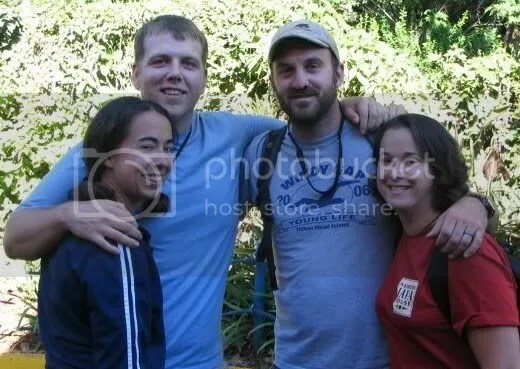 This is Kim, Brad, Jonathan & I in Nairobi last month, on the last day of our trip. Kim, Brad & I live near each other in MI – and have become good friends through our shared Kenya experience. Jonathan is our team leader, and lives just outside of Hilton Head, NC. He is on staff at Harvesters International part time – an great ministry. All three are amazing people and truly were a bright spot in an already-very-bright mission. This is my fabulous foursome in Kenya. We had so much fun, and laughed until we had tears. Until we ran out of breath. Until our abs hurt. We can be goofy around each other. And real. We can also talk about bodily functions in a way that I can’t do with ANYONE else. There’s just something about traveling to a remote location, away from everyone else that builds bonds. But here’s the thing – even if I was at home, in my comfort zone, surrounded by my normal life: I would still choose to hang out with these dorks. Because they accept me as my dorky self. Have a great Friday, and an even better weekend. Don’t forget to stop by Candid Carrie’s blog to see who else is playing along! I think last week’s chaos may have actually pushed me over the edge. I was reading Derfwad Manor today and saw her post about National Blog Posting Month – aka NaBloPoMo. sidenote: if you are not reading Derfwad Manor, what are you waiting for? Mrs G always has something good cooking at her place! Apparently I am crazy enough to attempt to post every day this month! I have seen other bloggers over the years do this – and I really enjoyed following along with their (often failed) attempts. So here I am – showing up for my own failure attempt! I am even so ambitious that I FINALLY learned how to correctly do buttons and badges on my sidebar. Go Me!